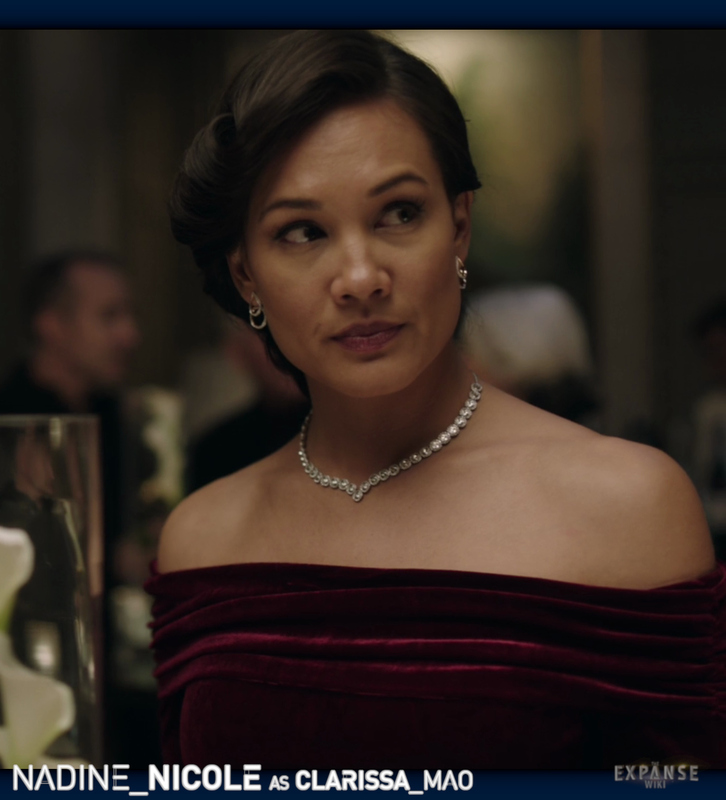 On The Expanse television adaptation, the character of Clarissa "Peaches" Mao is played by actress Nadine Nicole. There really isn't a good art piece done by an online artist (at least I couldn't find one on DeviantArt), so I just skipped finding one and included the one at right so you know who I'm talking about. Clarissa is the daughter of Jules-Pierre Mao and the sister of Julie Mao (who is the protomolecule-infected person responsible for setting off the destruction of Eros Station and who consequently saves Earth by piloting Eros Station into a collision with Venus). Jules-Pierre Mao is a famous and very rich scientist and psychopath who thinks that the protomolecule is the best thing ever, and that it represents untapped wonders for the human race (no matter what the cost). It's clear in the story that Clarissa has a lot of family baggage. Jules-Pierre Mao loved Julie way more, and Julie was always the center of attention despite the fact that she ran away from home to live in the asteroid belt and essentially disowned herself of the family wealth. However, when Jules-Pierre Mao's crimes finally caught up with him (mostly due to the actions of Captain Holden but really coming from Chrisjen Avasarala's political power), the wealth and power the Mao's enjoyed all ended. Clarissa's family was essentially, completely destroyed, and their reputation marked them as "pariah's." This made Clarissa very angry, and she set off for the stars meaning to avenge herself namely on Captain Holden and everyone he loved. Along the way, she indulged her psychopathic side and got implants that gave her the strength of ten really strong guys so that when she got into a scrap, she killed whoever dared to raise their hands against her (or stand in the way of her plans). She killed multiple people, even keeping one person's body in an oversized suitcase that she managed to squeeze him into so that she could put him in a locker (and this was a friend by the way). She engineered the destruction of an entire starship and its crew in an attempt to incriminate Captain Holden of the Rocinante. When she tries to kill Holden's crew directly by flying to their disabled ship, she gets stopped right before she can kill Naomi (Holden's lover) and then she's arrested. That isn't the end of her story. Clarissa (after the Ring's open) is taken as a prisoner to Earth where Amos (when he's visiting Earth in Nemesis Games) goes to visit her. That's where the "Peaches" nickname comes from. Amos just likes calling her that, and it becomes his pet name for her in every conversation that they have. I think it's mostly because it's obvious that Amos loves her in a way that only Amos understands, and that she's pretty and soft to look at, but at the same time, she's an incredibly dangerous serial killer psychopath person. Clarissa ends up making a home on The Rocinante and Holden and the crew make peace with her because the time in prison, the destruction of Earth, and everything that they've been through just all seems to bring out the humanity in everyone. She lives with them for thirty years (there's a thirty year time jump between Babylon's Ashes and Persepolis Rising). When she finally meets her end on Medina Station--helping Naomi and others get away from the center of the Laconian occupation--I gotta say that it really got to me. As she's dying, she says to Naomi, "I'm a monster." Of course, without context, Naomi didn't understand what Clarissa was saying (and it goes back to a thing that Amos and Clarissa shared together). Clarissa had said in that earlier conversation (in a prior book), "I have killed. But I am not a killer." And there was this whole thing about her not being a monster just because she killed people. Only, at her very end (after having just killed somebody), Clarissa realized that all of the years she'd spent living with regret, doing quiet penance for the lives she'd ended, didn't really matter because killing the last guy a few seconds ago really felt fun. Peaches was a spectacular character that kind of came out of nowhere, and it's one of the reasons I love this show and these books so much. She sounds like a pistol. You know, you read about lives like that and it really hits you just how normal, boring, but unscrewed-up your life really is. Just dropping in to say Hi. I haven't seen this show, but it sounds like something I would like. I'm impressed with the way you can summarize a complex story and a character's psychological twists and turns. And I so never want to meet anyone like Clarissa ever.